As a full time volunteer, outside of utilities, the biggest monthly expense is the food bill. Now, you may be working full time, or still a student, or any number of things, but if you are living on your own you would probably agree that food costs are prohibitive, particularly if you are aiming for healthy eating and have limited funds. Well it may be very tempting to buy ready-made or “just heat” meals, a bit of pre-planning, pantry prep, and cooking courage can make healthier, and tastier meals in just as little time. In the next few weeks, I’ll cover some of the basics I’ve been learning, and some of the tips and tricks I’ve found helpful in becoming fully independent in my own kitchen. Healthy eating on a budget requires some forethought, a bit of planning, and sometimes a good bit of cupboard space. Your pantry cupboard, or series of cupboards, is your friend. And, your first pantry ally for healthy eating is your spice collection. Those little bottles are sure pricey… Yep, but a little goes a long way and just changing up your spices can change a bland pre-cooked chicken breast into a tasty Asian style stir-fry, with added veggies of course. The following is some of the spices I use most frequently. Of course, if you are allergic to one of these spices you should not cook with it. These are useful mostly in curries or curry soups. It can also be used for “golden milk” an anti-inflammatory herbal drink. Ginger: Dry is less potent compared to fresh, I like keeping fresh ginger root on hand. Ginger goes well in soups, stir-fries, curries, and can be used as a quick tea for settling an upset stomach. These are the classic “pumpkin pie” spices, and go excellently on roasted sweet potato, squash, and carrots. Cinnamon on it’s own is excellent lightly sprinkled on coffee, or in oatmeal. Onion: Usually fresh, but you can use dried onion powder or chips if you have them. Awesome in broth, soups, browned with ground meat, or cooked with chicken as a “pre” flavor. Garlic: Fresh or dried and powdered, both work well. Garlic goes well paired with onion in soups and pre-cooking, it is also useful for garlic bread, pasta and pizza sauces, and taken as a whole clove in a spoonful of honey for a flue/cold deterrent. Italian Seasoning: Also known as oregano and basil, I usually keep this on hand dried as it makes it very easy to assemble my own pasta or pizza sauce, or Italian style chicken/beef. Cajun: Use with caution, as it will add a hot kick to any dish. I usually use less than a quarter teaspoon in 2-4 serving dish. While plain table salt will work, I prefer using a basic sea-salt, sometimes alternated with a low-sodium sea-salt. Sea salts have more minerals than just salt, and hence are a slightly better choice. When you are cooking from scratch, the only salt in your food is what you add yourself, unlike pre-packaged foods that have an abundance of added sodium for flavor and crave factor. Either sauce, paste, dried tomatoes, or all three. Tomatoes are versatile and a tasty addition to any meal. Pizza sauce can be made with tomato paste plus herbs, while the addition of a bit of water turns tomato paste into tomato sauce. A simple tomato soup can also be made with paste plus milk and spices. The average container of tomato paste will give you flavor enough for 3 meals and is relatively inexpensive. The best way to build your spice collection is to add one spice every shopping trip, or one spice per month. This way the expense is spread out, and you can learn each spice as you add it to your arsenal. I rather like grains, beans, and other carbs as it is very easy to cook enough for multiple meals and then combine them to make completely different tastes. Oh, and they are also usually very inexpensive, at least the dried versions. For example, a package of pasta can be used for a standard pasta dish, leftover cold pasta can become a pasta salad with the addition of veggies, a different dressing, and possibly some tuna, the remaining plain pasta can be baked with cooked chicken, tomato sauce, and cheese to make a baked pasta casserole. This makes healthy eating a breeze, at least if you continue to consume carbs. Now, I personally only keep a few grains on hand due to following a largely Paleo protocol. However, I recently discovered that having a few simple carbs on hand can be helpful, even if I don’t eat them regularly. This past Friday, I woke up with a very upset stomach, and by the end of the day hadn’t eaten anything and had no desire for veggies or protein. Plain rice worked, and didn’t upset my stomach. The next day I had rice and plain pasta, and the third day after my sudden illness I was fine with pasta and other items mixed in. The fourth day, I was back to business as usual and very glad for having had the simple carbs on hand that my stomach needed to help it settle. You can get very cheap, or very expensive brands. But, a single package of average macaroni or pasta noodles will give one person 4-6 servings, less if you just eat the pasta and more if you mix it with meat and veggies. Pasta will often go on-sale, so picking up a pack here and there makes it easy to always have on hand for your meal prep, while not spending a huge amount building up your pantry. I like getting a wild rice blend, but plain white rice can also be nice to have on hand. One cup of dry rice is equal to four servings when cooked, a half kilo package has 4 cups of dry rice. Rice goes well as-is, with tomato sauce and meat as “Spanish rice,” or in soups and stews. You can even use rice as a substitute for breakfast oatmeal by re-heating cooked rice and adding a bit of fruit, sugar, and/or milk. I like oatmeal as a relaxed weekend breakfast, usually with dried fruit and a spoonful of honey. It’s not difficult to make, and there is no need for sweetener when topped with a light sprinkling of cinnamon. Dry beans, particularly the bulk bags, are usually inexpensive and can be a good source of plant based protein. Make sure to consume beans with rice, or anther grain to give your body the full range of amino acids. Just make sure to properly soak the beans before cooking, and discard the soaking and cooking water. To make sure your beans fluff up, don’t cook them with tomatoes or tomato sauce, add the tomato sauce after the beans are finished being cooked. I keep a small bag of whole wheat and white flour on hand at all times. It’s quick and easy to make tortillas, home made pasta, or just if I spontaneously want to make muffins/scones/cookies or whatever. White flour usually won’t go rancid, but sometimes whole wheat flour can go rancid, keep a nose out in case your flour starts smelling off and if it goes off discard. If you bake, or like sweetened tea/coffee or hot chocolate, you’ll probably want to have some white sugar on hand, and brown sugar for baking. You can sub out 2 tsp from a cup of white sugar for 1tsp honey to get the same flavor and effect as brown sugar in your baked goods. But, you may need to turn down your oven temperature slightly as honey browns faster than regular sugar. I usually buy fresh veggies once a week, and only get as much as I’ll use in a week. The exceptions are onions, carrots, cabbage, and squash as I know those will last longer than one week on the counter, or in the fridge. For fruit, I usually get enough for one piece a day, but I get enough veggies for at least 3 – 5 servings a day. Okay, I like my veggies and I’m in a country with an overabundance of fresh fruit and veggies, so certain things are often cheap. Figuring out what veggies and fruits are least expensive, and that you enjoy, is a key part of healthy eating and sticking within your budget. You will need to evaluate your local stores, and possibly farmer’s markets or farms, to figure out your least expensive source of fresh fruits, veggies, and greens. However, I like keeping a few cans of baby corn, peas, and other canned veggies in the cupboard. As well as a few bags of frozen veggies for quick additions to meals. Sometimes I will get frozen fruit, but where I am the fresh fruit is nearly always cheaper. One of my favorite tactics is to buy veggies that go well together, say beets, butternut squash, carrots, and onions. Then, chop them all, drizzle with spices and olive oil, and bake till done. Then, divvy up the baked veggies and store in the fridge/freezer to consume over the week. So Tasty! This is always going to be the individually most expensive part of your grocery shopping. More so if you are following a more paleo protocol for your healthy eating guidelines. But, take heart! there are lots of ways to combine and stretch meats so that you can continue eating healthy within your budget. Price check carefully and figure out what inexpensive cuts or preparations will work for your needs. Craving steak? Get a tougher cut and marinate it. It takes more time, but it will end up tasting just as good as the more expensive one with the right treatment. Same with a beef roast, get a tougher roast and slow-cook or stew it. You may only buy beef once a month, but most roasts can be stretched for 6+ meals for one person (soup, sliced and put in the freezer for stir-fries, sandwiches, and other meals throughout the rest of the month). A salmon fillet may seem expensive, but there are fish that is not expensive, and can be happily stored in your pantry. Tuna is a standard go-to, but due to the commonly high mercury content, it’s recommended not to make tuna a major part of your diet. However, if you are willing to experiment, canned sardines taste almost identical to tuna and are healthier for you and the environment. Sprats, another small fish have a stronger flavor but are also surprisingly tasty. I like keeping a few cans of sardines and sprats on hand for quick dinners and lunches. Cheese and butter can be stored for months in the fridge, though cream cheese is best used quickly. As I don’t eat a huge amount of bread, I actually use very little dairy and rarely, if ever, buy milk. I like keeping butter on hand, for baking. And, for me, that’s about it. Chicken is usually the cheapest type of meat you can get at the grocery store, at least if you take the time and check the price per kilo/lb. I like purchasing chicken in advance, and baking it one day of the week for the rest of the week’s dinners. It’s efficient and I can slice and stir-fry or otherwise combine the pre-cooked chicken to make a more adventurous dish. Eggs can also fall under the poultry label, and seriously these things are jammed with protein and are usually very inexpensive and perfect for healthy eating. If you are trying to get a decent amount of protein but don’t have the money for meat, get eggs. I prefer hard boiling 10 eggs on Sunday, and then eating two each morning before work for the rest of the week. Usually I take a small container of sliced veggies, about a cup and a half worth, to eat throughout the morning as the other portion of my breakfast. Whole coffee beans can be stored for a year or more, while ground coffee should only be stored for a few months. If you drink coffee, plan to grab an extra container or two if/when your favorite brand goes on-sale or you find it for a lower price than usual. Plain cocoa powder is excellent for baking, or for making your own hot chocolate. It’s more cost-effective to buy the plain powder and add sugar/milk when you make the cup of hot chocolate than it is to buy the pre-made mix. Pre-made drink mixes charge you a premium for inexpensive sugar. I don’t know about you, but a wide variety of tea flavors is just too awesome. I like picking up a new tea each month, even though I don’t use up an entire box of tea in a month. This way I always have a few herbal and regular tea options on-hand for when I want something hot to drink. Pick up canned and dried items as you see them on-sale or available. Just add one or two to what you would normally purchase, and save them for a later meal. Sometimes generic brands will be cheaper than name brands, so don’t be afraid to try different brands if they are less expensive. Try new foods – sardines are just as cheap as tuna, and healthier for your body (less mercury), and the environment as the sardine populations have quick turn-over. When I came to Israel, I adopted a mindset of adventure, I will try any food once. If I like it, I can add it to my diet or my treat goals. If I don’t like it, I don’t need to have it again. In this way, I’ve added sardines, sprats, and canned cod livers to my diet… oops. But, I still don’t like blue cheese. This is just a quick summary of some things I am learning while assembling my weekly meal preparation. Next week, I’ll be talking about some of the options to pre-prep breakfast, both for a regular diet and a paleo (ish) diet. 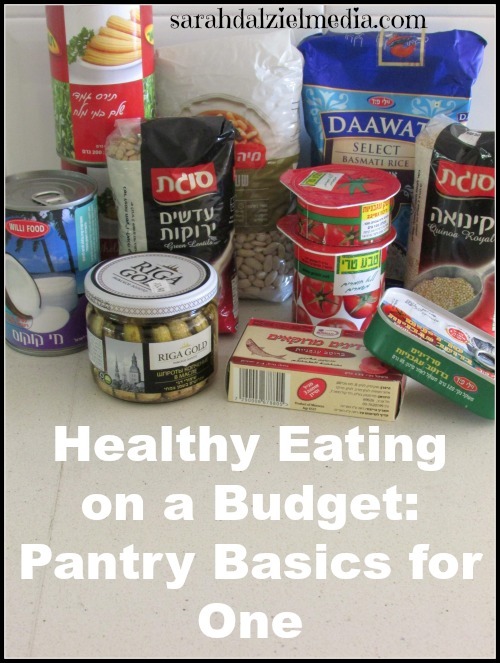 Is there something you would add to your pantry that I haven’t listed? A spice you love using? Leave a comment! I love hearing from you.